Copyright © 2000-2004 D.J. Eernisse. All Rights Reserved. Polytomy is a term for an internal node of a cladogram that has more than two immediate descendents (i.e, sister taxa). In contrast, any node that has only two immediate descendents is said to be resolved. Overall, we refer to a cladogram in which all internal nodes are resolved as fully resolved (below left), whereas a cladogram that has a mixture of resolved nodes and polytomies as partially resolved (below center). A cladogram that is completely unresolved is termed a star tree (below right). Polytomies can represent two different cases. First, they can represent the literal hypothesis that a common ancestral population split through cladogenesis (i.e., speciation) into multiple lineages. Under this interpretation, such an internal node is referred to as a hard polytomy (below left). Alternatively, someone who depicts a polytomy in a cladogram is not really expecting that the same ancestor gave rise to all daughter taxa, but is uncertain which resolved pattern is the best hypothesis. Under these circumstances, such a node is referred to as a soft polytomy (below right). This is actually the more common intended meaning of a polytomy. The two cladograms below illustrate a common situation in phylogenetic analysis, when two or more competing fully resolved cladogram hypotheses may be equally well supported by parsimony. The following example is used to explain how such uncertainty is sometimes represented by a strict consensus tree. Consider cladograms A and B above. These cladograms differ in the hypothesized relationship of the turtle to other reptiles (*). 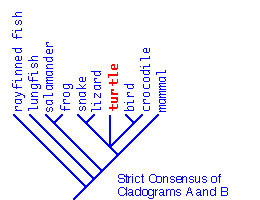 Cladogram A is the hypothesis that the turtle is sister taxon to a clade, bird + crocodile (Archosauria). Cladogram A is the more conventional alternative hypothesis that turtle is, instead, sister taxon to all other reptiles (cladistically redefined to include birds in this course!). This latter reptilian subclade is referred to as either Sauria or Diapsida, depending on which name is preferred. Cladograms A and B can be "combined" as a strict consensus cladogram. This is one of several types of consensus trees. Specifically, a strict consensus preserves only those internal nodes in common to two or more cladogram hypotheses on which it is based. Note, for example, that birds + crocodiles was supported in both cladograms A and B (above). So birds + crocodiles is also found in the strict consensus (left). Likewise, snake + lizard is found in the strict consensus. However, cladograms A and B differ in their placement of turtle. This leads to a collapse of internal nodes supported in either cladogram A or B so that there is now a polytomy in the strict consensus. This is thus a soft polytomy because we are using the strict consensus to summarize alternative fully resolved cladogram hypotheses. This is often convenient, especially in cases where there are many more than two (often thousands) of equally parsimonious trees, so that a strict consensus serves as a summary figure. However, a strict consensus is not without drawbacks. In particular, note that there are actually more than the two (cladograms A and B) resolutions of the polytomy that could be summarized by this strict consensus, so that there is no way of knowing which (of many) fully or partially resolved cladograms are summarized by the strict consensus. To illustrate this limitation, consider that in the strict consensus of cladograms A and C (below) is identical to that of cladograms A and B. Yet these identical strict consensus trees are based on very different premises. 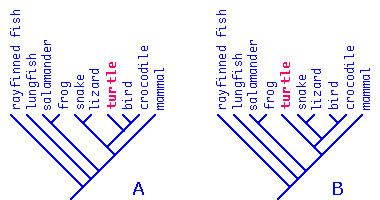 In the first case (cladograms A and B in previous example), turtle was equally well supported as sister taxon to other reptiles (cladogram B), and turtle was not supported as sister taxon of snake + lizard (cladogram C), whereas in the second case (favoring cladograms A and C), the opposite statements are true. The point is that a polytomy in a cladogram introduces ambiguity concerning what tree(s) are best supported as most parsimonious by the data at hand. *Cladogram B is the conventionally preferred hypothesis although recent molecular evidence has been accumulating in favor of cladogram A, placing turtles as either sister taxon of Archosauria (including crocodiles and birds) or else within archosaurs, usually as sister taxon of crocodiles. Click here for links to these different views or return to example. This page was first written on September 11, 2000 and last modified on March 23, 2004.